Hello Good Friends! It’s Judy here today. 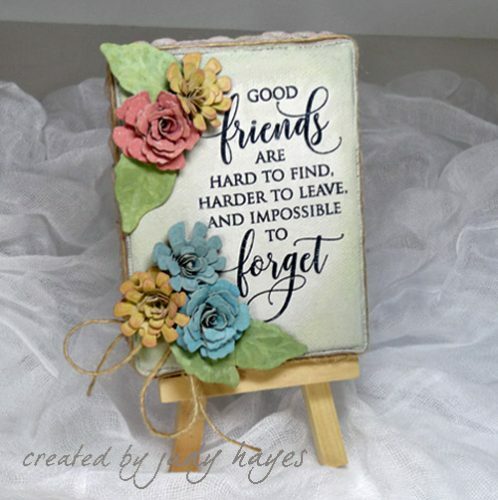 I’m sharing a Good Friends Mini Canvas created just for you withArt Medium, Lace Ribbons and Adhesive Dots 3D and Adhesive Dots Medium. I enjoy making little canvases like this for special friends. It’s tiny yet says a lot! I started this Good Friends canvas by attaching the Lace Ribbons around the edge of a 3 x 4ʺ canvas using Art Medium. It works really well as a glue! Next, I stamped the verse on white tissue paper with black ink and clear heat embossed it. I painted the canvas including Lace Ribbon with chalk paint. I brushed on another layer of paint on front and placed the tissue paper with verse over the wet paint. I smoothed in place and then carefully tore off the excess at the edges. I lightly brushed paint over the tissue and around the verse, even lightly brushing over it. 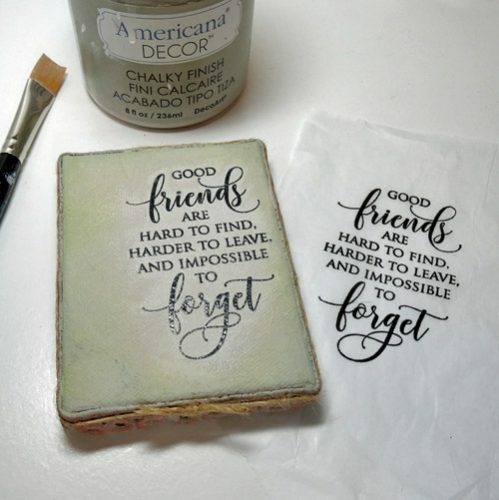 A very light rubbing with a damp paper towel removed any paint that covered the verse. I sponged on a bit of Distress Oxide inks around the verse. 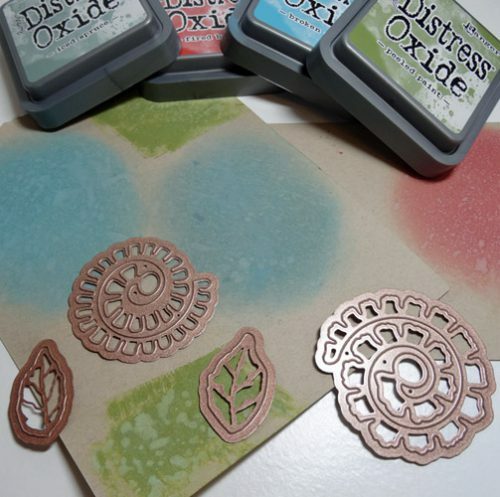 I also sponged on Fired Brick Oxide ink lightly over the Lace Ribbon. Then I fastened twine around the Lace Ribbon using Art Medium to fasten it. Once the flowers were rolled, I used Adhesive Dots 3D to fasten the bigger flowers together and Adhesive Dots Medium for the smaller ones. 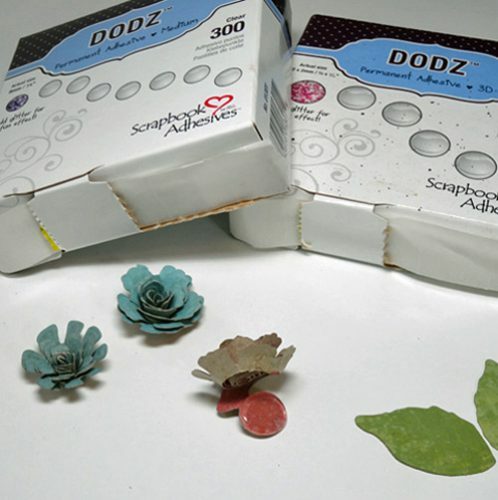 The Adhesive Dots make it so easy to put together these little flowers! I fastened the flowers and leaves to the canvas with Adhesive Dots Medium. I tucked a twine bow under the flowers, also fastened with Adhesive Dots Medium. This canvas is for you my Good Friends! So happy you visited today! 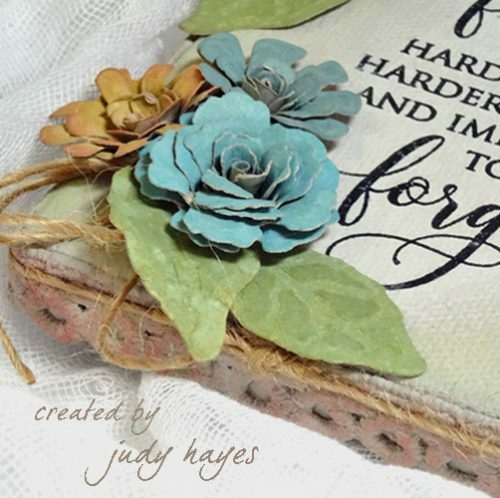 This entry was posted in 3D Projects, Adhesive Dots & Lines, Adhesives, Canvas, Crafts & Tutorials, Gifts, Mixed Media, Tutorial and tagged Adhesive Dots 3D, Adhesive Dots Medium, DecoArt, IMAGINE Crafts/Tsukineko, Judy Hayes, Penny Black, Ranger Ink, Spellbinders Paper Arts, Tim Holtz, Tutorial. Bookmark the permalink. 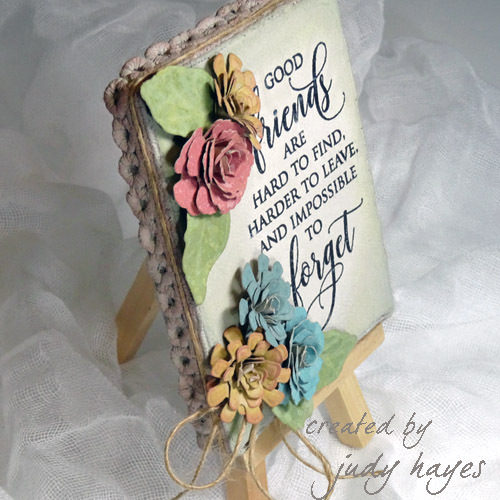 One Response to "Good Friends Mini Canvas with Lace Ribbons + Adhesive Dots"